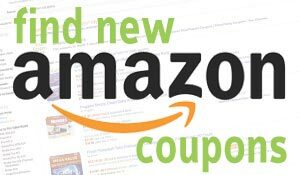 Thunderhawk Nerf AccuStrike Mega Toy Blaster – Longest Nerf Blaster – 10 Official AccuStrike Nerf Mega Darts, 10-Dart Clip, Bipod – For Kids, Teens, and Adults is now available at Amazon.com for just $24.88 (REG $49.99) (As of 11 February 2019, 20:03 PST – Details) with $25.11 (50%) Savings. 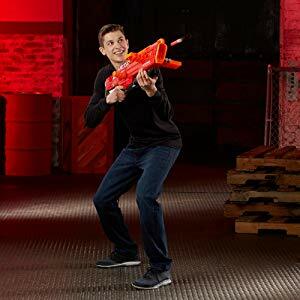 The Thunderhawk bolt-action blaster is the longest Nerf blaster, extending to 41 inches (1 meter) to go long and go strong in Nerf battles. 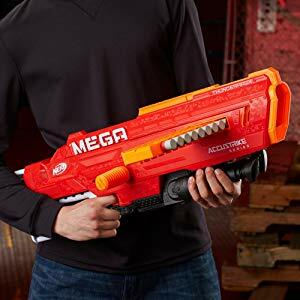 This Nerf toy blaster comes with 10 AccuStrike Nerf Mega darts that are designed for accuracy and are the most accurate Nerf Mega darts*. You can adjust the blaster’s length by sliding the barrel — extend it for distance targeting and retract it when you’re moving fast and need to stay mobile. Stabilize the blaster to set up the perfect shot with the folding bipod that attaches the Thunderhawk blaster’s tactical rail. 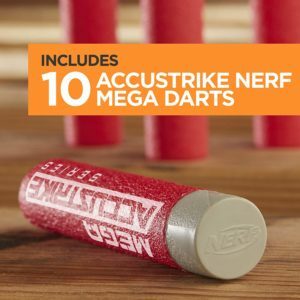 Official AccuStrike Nerf Mega darts are tested and approved for performance and quality and constructed of foam with flexible, hollow tips. Experience the excitement, energy, and attitude of the Nerf brand, and find out why It’s Nerf or Nothin’. 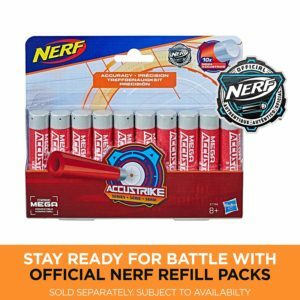 Nerf blasters from Hasbro deliver the ultimate in blaster performance for Nerf battles. 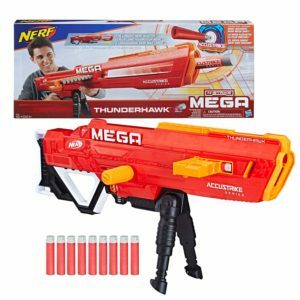 The Thunderhawk blaster is the longest Nerf Mega blaster and comes with AccuStrike Nerf Mega darts, the most accurate Nerf Mega darts. 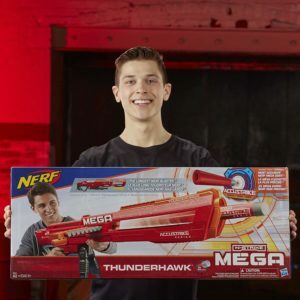 Go long and go strong on the battlefield with the Thunderhawk blaster — it’s the longest Nerf blaster of all, measuring 41 inches (1 meter) when fully extended. 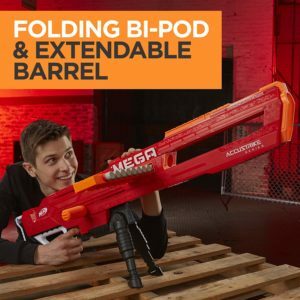 Slide the barrel to adjust the length, load the 10-dart clip into the blaster, and get ready to take on opponents with bolt-action blasting and the accuracy of AccuStrike Nerf Mega darts. 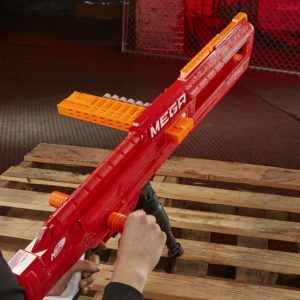 Carry the Nerf Mega Thunderhawk blaster into battle when the action demands mobility, adjusting the length as the action changes to go from extended mode to compact mode. 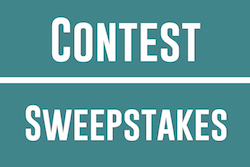 Use the fold-down bipod to stabilize it for distance shots in a fixed position. 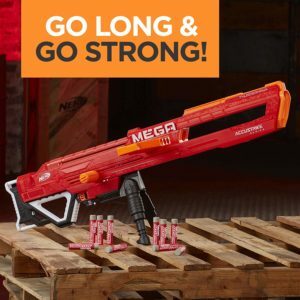 Challenge the competition with the most accurate Nerf Mega darts and the longest Nerf blaster – the AccuStrike Series Nerf Mega Thunderhawk blaster. 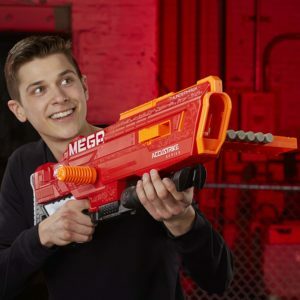 Blast the most accurate Nerf Mega darts with the first Nerf Mega AccuStrike blaster! 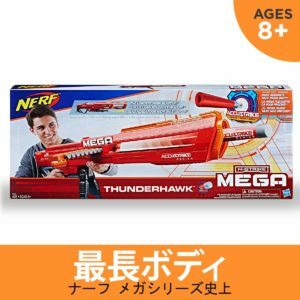 The Thunderhawk blaster comes with 10 AccuStrike Nerf Mega darts designed for accuracy. 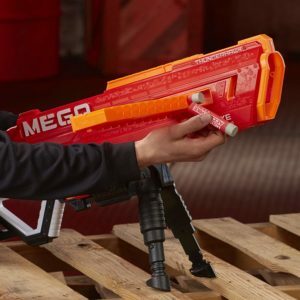 Part of the AccuStrike Series that features the most accurate Nerf Mega darts, the Thunderhawk blaster brings the awesome combination of AccuStrike accuracy to Nerf Mega battles.